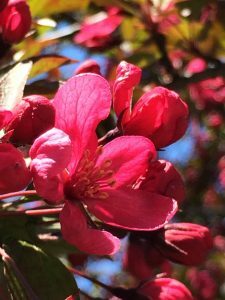 I have four types of crabapple trees in my yard. 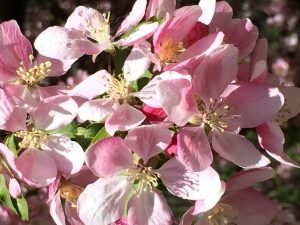 One isn’t blooming this year–it’s a biennial–which leaves the Louisa, the prairiefire, and the tree of unknown variety behind the garage. The Louisa is a miniature weeping-willow variety with pale pink-white blossoms. 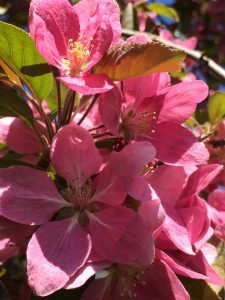 The blossoms of tree behind the garage are a deeper pink. My favorite, the prairiefire, is more a shrub than a tree. It blooms later than the others, so that it’s at its peak when the others are fading. Its blossoms are deep magenta. They all fade too soon. Then I have to wait for the miniature roses, the hardy hibiscus, and the hydrangea. ← Previous Previous post: What do you mean it’s May already? ?